God continues to reward our faith in His provision. God comforts us in our grief and gives grace. Gertrude’s mother is home with the Lord! We have a great team of prayer partners. We have spiritual and physical vitality. Thank God for His people who give faithfully to our ministry. 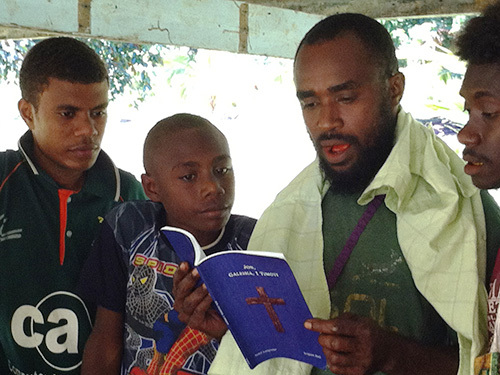 We’re seeing translation progress although we are back to two Notsi Bible translators. We rejoice that the Gospel of John, Galatians and 1 Timothy has been published! We continue to enjoy reading through the Bible together in one year. Introduction of a new phonics method is helping local teachers to teach reading and writing in their own languages. Grace and favor on our partners in Bible Translation. That’s our prayer for you! Comfort for Kevin’s sister Karen, whose husband passed away on June 24th. Physical and Spiritual vitality for Notsi translators as they record the Gospel of John while continuing with translating other New Testament books. Kevin and Gertrude’s spiritual and physical health. Family members living with chronic illnesses such as diabetes, high blood pressure and other ailments. Committed and capable literacy teams for Notsi, Nalik, Notsi-Madak and Barok languages. Salvation of unsaved relatives and re-dedication of those who have walked away from the Lord. For Kevin as he works on plans to visit our partners in ministry and that we’ll have the funds needed to purchase return tickets to Papua New Guinea. Spiritual growth of lay Christians among the Notsi, especially those involved in Bible translation. Partners in ministry for new Wycliffe missionaries—for prayer and finances. Gertrude—for grace and strength as she takes a few courses to assist in her Literacy work. Safety in our travels as we travel around the country visiting family and partners in ministry. Wisdom and proactive approach of local church leadership in appointing local people to train in Bible translation and literacy—committed people who are able to assist with Bible Translation. Guest house managers to come serve long-term in PNG—especially in Kokopo and Kavieng. The Notsi to purchase and read the published Scripture portions. Next Post Rejoicing in the New Year!